Our tool of choice for building mockups is Balsamiq. It's simple and straightforward but has a healthy feature set as well. It's designed around collaboration and is an industry standard. Balsamiq has a brief free trial but it isn't free software. They have a desktop version that you can pay a fixed price for or an online version that you can pay monthly. This mini-course will have you building mockups using Balsamiq but you will not be required to do so in the future or during the intensive program (you'll only need to view .pdf output files). Because of this, the free trial should give you enough time to get practice building mockups but you won't need to upgrade to the paid version if you don't want to. That said, there are free alternatives available on the web. We haven't found any of these to offer the same set of advantages but, as with all things, all that really matters is that you find a tool which you can use comfortably and well. See the Resources tab for some of these alternatives. Go to http://balsamiq.com/download/ to download the 30-day trial. The desktop version is probably your best bet. Another reason we really like Balsamiq is because their site is full of simple and straightforward videos for learning the software as well as user-submitted widgets and extensions that will make your life even easier. Next, there are more videos and tutorials at their support site but the following ones should get you on the right path. After that, experimentation is your best ally. How to Download and use MockupsToGo Submissions shows you how to take user-submitted mockups (which might be things like widgets or windows) and use them in your own mockups (as "symbols"). Now Download the 960 grid mockup and keep it with you. It will help you build layouts which fit the grid system. For additional goodies, browse through their support portal and their documentation site. 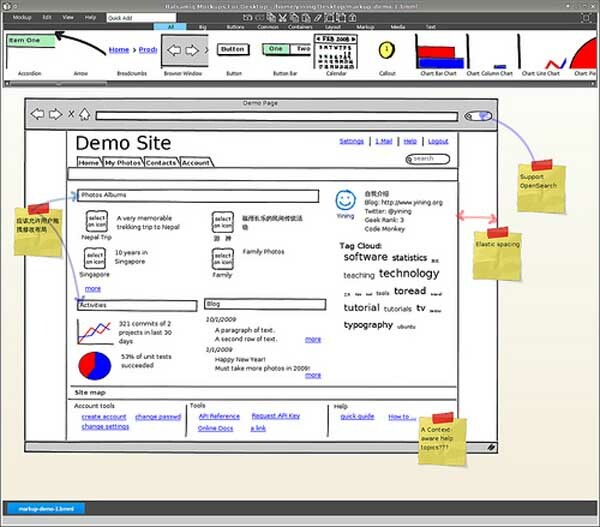 The best way to learn Balsamiq Mockups (or any other mockup tool) is to keep experimenting and then return to their site periodically to learn a bit more via their videos or user submissions. It's a very simple concept with some useful extensions so you'll be using it productively in no time.